Refractory black carbon aerosols (rBC) emitted by biomass burning (fires) and fossil fuel combustion, affect global climate and atmospheric chemistry. In the Southern Hemisphere (SH), rBC is transported in the atmosphere from low- and mid-latitudes to Antarctica and deposited to the polar ice sheet preserving a history of emissions and atmospheric transport. Here, we present two high-resolution Antarctic rBC ice core records drilled from the West Antarctic Ice Sheet divide and Law Dome on the periphery of the East Antarctic ice sheet. Separated by ~3500 km, the records span calendar years 1850�01 and reflect the rBC distribution over the Indian and Pacific ocean sectors of the Southern Ocean. Concentrations of rBC in the ice cores displayed significant variability at annual to decadal time scales, notably in ENSO-QBO and AAO frequency bands. The delay observed between rBC and ENSO variability suggested that ENSO does not directly affect rBC transport, but rather continental hydrology, subsequent fire regimes, and aerosol emissions. From 1850 to 1950, the two ice core records were uncorrelated but were highly correlated from 1950 to 2002 (cross-correlation coefficient at annual resolution: r = 0.54, p < 0.01) due to a common decrease in rBC variability. 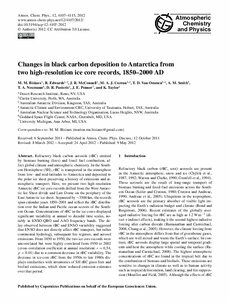 The decrease in ice-core rBC from the 1950s to late 1980s displays similarities with inventories of SH rBC grass fires and biofuel emissions, which show reduced emission estimates over that period.